RUSH: “Documents Show [Department of Justice] Was in Panic Mode After Loretta Lynch’s Secret Meeting With Bill Clinton Was Exposed.” I had this yesterday. We found there were 413 pages of emails associated with it. Bill Clinton met Loretta Lynch for a half hour in the airport tarmac in Phoenix, and James Comey lied to news agencies seeking Freedom of Information Act requests — or making those requests — for any evidence, any documents surrounding the meeting. Comey said: There aren’t any. There’s no paperwork. There was a meeting on the tarmac. Four-hundred and thirteen emails — well, 413 pages. Don’t know how many emails. And it turns out these people are using aliases, fake names so that they would not be discovered. 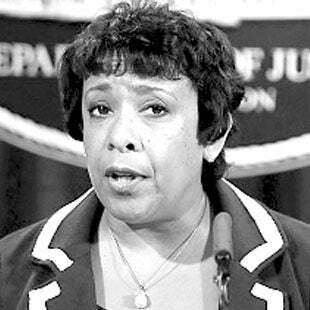 “When former Attorney General Loretta Lynch and President Bill Clinton were busted secretly meeting aboard Lynch’s private plane last summer by a local television reporter, a number of government watchdog groups filed lawsuits for documents surrounding the meeting.” The FBI, under James Comey, denied any such documents existed. Why? Were they discussing matters of national security? Why are the things Loretta Lynch and Clinton were saying to each other redacted in these documents? Why redact a discussion about grandchildren? That’s what Lynch said they were talking about. She doesn’t have any, but Clinton does. He has at least two that we know about. Why redact that? “Just days after the meeting took place, former FBI Director James Comey announced Hillary Clinton would not be referred for charges because prosecutors at the Department of Justice were highly unlikely to take on the case.” Nobody would bring charges, he said, ’cause she didn’t intend to do anything wrong. We come to find out that these emails, the people involved were using fake names to disguise themselves. That happened a lot, by the way, in the Obama administration. It was Matt Zapotosky at the Washington Post who asked for a few more details about the meeting because he was hoping to put the story to rest. He said, look, I want to help you put this to rest, but my editors are still pretty interested in it. So the media was trying to help Loretta Lynch bury this, and they were asking for any support they could get to help put this thing to rest. I still can’t get over this many pages. What in the name of Sam Hill was being talked about here? And why all of that paper to document it? It’s not the kind of stuff that we’re gonna see in a presidential library someday. I just can’t imagine generating that kind of paper. There’s not a single person with whom I communicate email-wise or otherwise over the course of my life about which there would be 413 pages of it. And yet one 30-minute meeting generates all that? I know I’m naive, but that to me is incomprehensible. And if a 30-minute meeting on the tarmac generates this kind of paperwork, can you imagine the paperwork a normal presidential day, a Department of Justice day generates? No wonder these presidential libraries have to be so damn huge. This is still astounding to me.